It's on AMS Performance's Website. 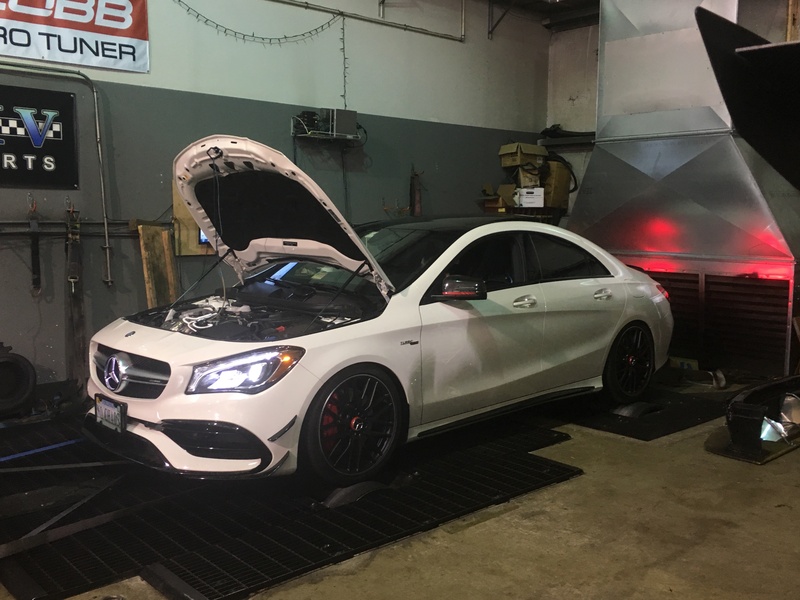 Here's what they wrote..."From the factory, you can expect your Mercedes-Benz CLA45 AMG to produce a high level of boost pressure (27.5psi as tested)." Although, I originally looked at only a snippet from the site. Now that I've actually read the whole thing, it's possible they're even saying this applied to the pre-facelift models. I don't recall reading any claims that OE boost on pre-facelift cars was underrated by the factory. AMG proudly proclaimed these cars were making major boost. Well it's like even with the 250 "Mr. Guido Vent in charge of gas engine development on smaller Mercedes vehicles, tells us that there is an unadvertised overboost effect during kickdown with one's foot to the floor, which results in roughly 13 more hp and 15 more lb-ft of torque for brief bursts." So when aftermarket companies "test" (but don't publish the entire test map?!) they probably found that secret peak boost number which is >26psi. I bet there is an easter egg in the 45 ECU software that allows a much higher level of boost (under the right circumstances). Easter eggs are good...but Cadbury mini eggs are better. So I finally was able to get the car on a dyno for a few runs this Wednesday. It was done at Mach V Motorsports in Sterling, VA (Northern VA/DC area) nice guys and a really good price too. So if your in the area and need a AWD dyno check them out. BTW, they use a Dynojet Research. Keep in mind my 2017 has the AMS Intake & filter along with the DTE Systems piggyback module (made in Germany) that I purchased from Matt @ Tricolore Performance. That makes it a "1.5" setup. 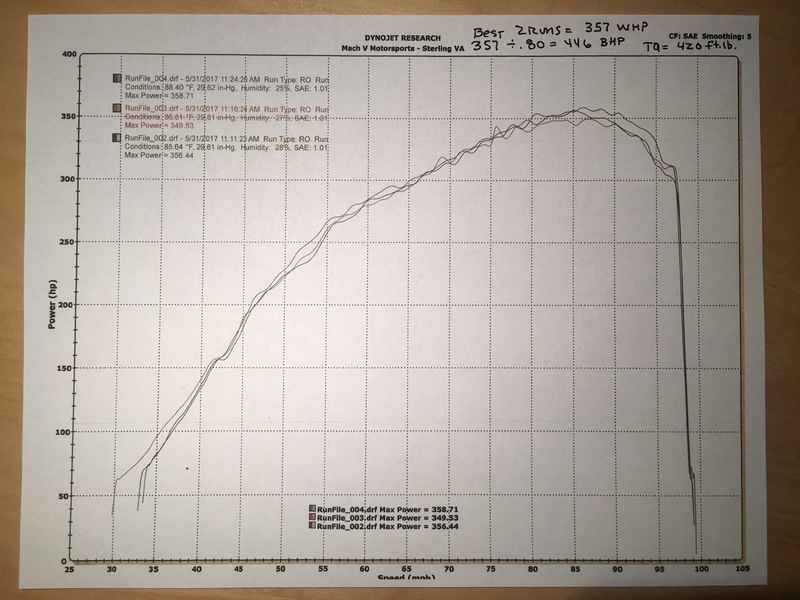 Best two run average was 357 WHP. Keep in mind, the drive line loss I was told by Mach V on AWD using the Dynojet Research is normally in the 18-20% range. For BHP it's simple math using the 20% loss estimate... 357 / .80 = 446 BHP. 446 at the crank is the best BHP estimate. No too shabby at all. Also so it's known, the car was running Sunoco 93 octane and it was in the mid 80's, 25% humidity. For me no need to split hairs on the end WHP or BHP numbers as the seat-of-the-pants performance speaks volumes. This 45's current set up is nasty fast. Last note- keep in mind, the 381 HP figure that MB advertises on the Facelift car is not HP. That is "PS" (metric for Euroland) in the US, that is why MB shows/advertises 375 HP. Slight difference but an important distinction. If anyone is considering this setup I can honestly say you will be happy. Plug-n-play simplicity for huge returns in fun! Last edited by nochaos; 06-02-2017 at 08:52 PM. They did a plot on a separate page. Torque ramped up starting around 2,850 RPM and maxed at about 4,300 and went sideways. Interestingly the HP and torque nearly paralleled each other from what I saw. Yes pls post the torque graph too.